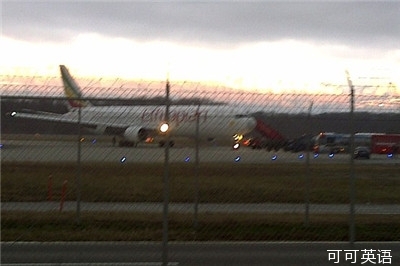 An Ethiopian Airlines jet en route from Addis Ababa, Ethiopia, to Rome was forced to land in Geneva on Monday after the co-pilot apparently took control of the aircraft in an attempt to seek asylum in Switzerland, authorities said. Police arrested the co-pilot of Ethiopian Airlines flight 702 after the plane made an unscheduled landing at Geneva airport around 6 a.m. Central European Time, Geneva airport authorities said at a news conference. Authorities identified the co-pilot as an Ethiopian born in 1983, who fled the aircraft using rope suspended from a cockpit window. The co-pilot was arrested by waiting police, according to the authorities. No one was injured during the event. The Geneva airport website identified the aircraft as a Boeing 767-300, but didn't say how many people were aboard. The hijacking comes less than two weeks after a plane flying from Ukraine with 110 passengers landed safely at an airport in Istanbul after a passenger claiming to have a bomb demanded the aircraft be redirected to Sochi, where Russia is staging the Winter Olympics. After a temporary closure, Geneva airport reopened for departures at 8 a.m. local time with arrivals starting at about 8:45 a.m., according to a notice on the airport's website. The co-pilot took control of the aircraft after the pilot left the cockpit to use the toilet. The co-pilot, who locked himself in the cockpit, was seeking asylum because he felt threatened in his home country, the Geneva authorities said. A hijacking by a flight crew for the purpose of seeking asylum is highly unusual. He said asylum laws may have influenced the choice of destination. Switzerland has relatively liberal laws governing asylum, though they have been tightened recently. The arrest follows early morning confusion at Geneva airport, which was shut down as the event unfolded. Flight 702 made multiple loops over the airport, which is located in French-speaking western Switzerland, before landing, according to Flightradar24.com, a website that tracks fights. A spokeswoman for Ethiopian Airlines said the airline was making arrangements for passengers to get to their original destinations. In 1996, three Ethiopians hijacked an Ethiopian Airlines flight to Addis Ababa as it left and demanded the pilots fly it to Australia in an apparent bid for asylum. The plane ran out of fuel and crashed into the Indian Ocean, killing 125 people, according to the Aviation Safety Network.